Sunday, June 9 2019— 9:30 a.m. – 4 p.m. This year, we’ve partnered with six special farms in the Brattleboro area to offer this year’s Stroll Weekend Farm Tours on Sunday, June 9. Each of these farms has something unique to offer, and will welcome you and share their work. One-hour tours are being offered at 9:30 AM, 11:15 AM, 1:00 PM and 2:45 PM. This schedule allows sufficient travel time between tours from one farm to the next. Not all times are available at each farm. Please limit your farm visits on June 9 to the scheduled times. Some of the farms have farm stores you can visit at other times. Please contact the farmers directly if you wish to visit their store on another day. Because space on each tour is limited, pre-registration is required! Click here or scroll down to register. The Farm Tours are free, but we appreciate any donations to the Strolling of the Heifers to help defray our costs. Thanks for your support! 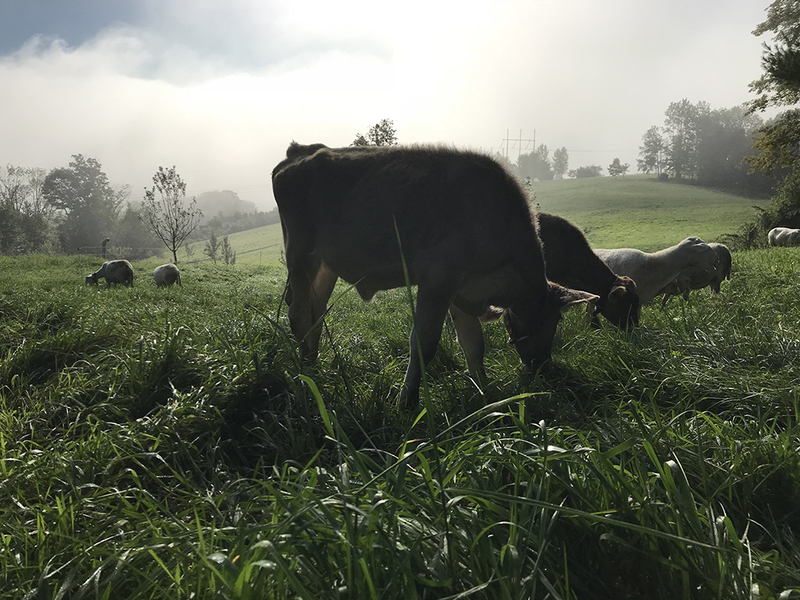 The 169-acre conserved Bunker Farm is a family run diversified farm comprised of four lines of operation: pasture-raised meat and poultry, annual and perennial flowers, maple syrup and community outreach and education. The farm tour will touch on all areas, including a pasture walk to visit the animals, a tour of the greenhouse, and an explanation of our wood-fired maple syrup operation. Visitors are welcome to purchase farm-raised chicken, pork, beef, flowers and maple syrup. Directions: From Brattleboro, head north on Putney Road/Route 5. At traffic circle (near Exit 3 off I-91), continue north on Rte 5 for 3.5 miles. Turn left onto Schoolhouse Road. Go approximately 1 mile and turn right onto Miller Rd. Go 1.8 miles and bear left to continue on Miller Rd. Turn right at stop sign onto Bunker Rd. The farm is on the left. 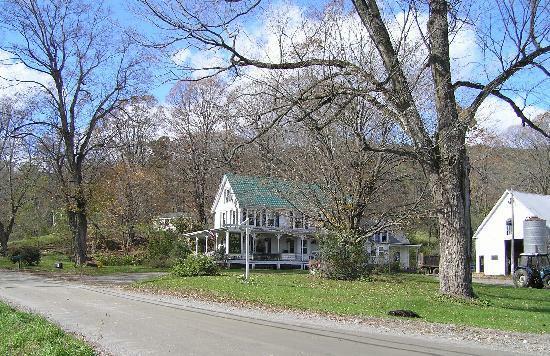 The Scott Farm consists of 571 acres located in Dummerston. This year we will harvest 125 varieties of ecologically grown heirloom apples, as well as a dozen other types of fruit. The farm has 23 buildings listed on the National Register of Historic Places and a recorded history dating back to George Washington’s first term as president. Since 1995, the farm has been owned by The Landmark Trust USA, a non-profit organization committed to historic preservation. Come join Zeke Goodband for a stroll in our orchard and learn a bit about the history of our heirloom fruits. We’ll discuss orchard ecology, learn about grafting and how it was used to create this orchard, and then do a little scouting for pests and discuss how we manage them. 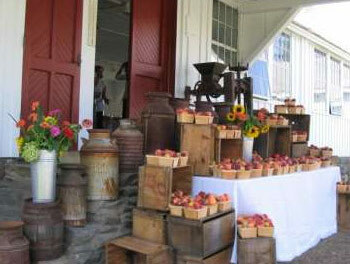 The farm stand will be open and orchard-related items will be available for purchase. Directions: From Brattleboro, head north on Putney Road/Route 5. After passing Hannaford Supermarket on left, make a left at next traffic light onto Black Mountain Rd. Continue for 0.6 miles, then bear right onto Kipling Rd. Continue 1.4 miles. Scott Farm will be on your left. Full Plate Farm is an intensively managed vegetable farm in East Dummerston. 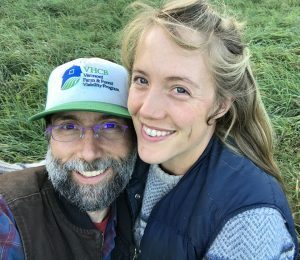 The 150 acre parcel, conserved through the Vermont Land Trust, was purchased by Matt and Laura three years ago through the Farmland Access Program. 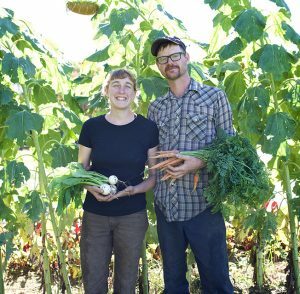 With just under 2 acres in cultivation, we grow a huge variety of vegetables, flowers, fruits and nuts to offer to our 80 CSA members, 2 farmers markets, and a number of local restaurants. Utilizing organic practices, we focus on growing high quality gourmet vegetables intensively and continue to seek out unusual and unique niche crops to offer, including ginger, turmeric, and heirlooms. We focus on nurturing the soils and rotating crops quickly with the goal of maximizing the land’s potential while maintaining efficiency needed to run a small farm. Visitors will tour the seedling greenhouse, wash and pack barn, 4 season high tunnel, vegetable fields and very young orchard. Visitors are welcome to bring a picnic lunch, stretch out in the sun and enjoy the magnificent view as well as walk a loop through stately oaks, some of our fields and past an old foundation. Directions: From Brattleboro, head north on Putney Road/Route 5. At traffic circle (near Exit 3 off I-91), continue north on Rte 5 for 3.5 miles. Turn left onto Schoolhouse Road. Go approximately 1 mile, turn right onto Miller Road and go .9 miles. Farm will be on your right. Rebop Farm is a small, diversified, grass based, and organic practice farm operating on 45 acres, producing raw cow milk and pastured meat, honey and maple syrup. We also offer hands-on workshops on a variety of topics, including cheese making, beekeeping, meat cookery, and fruit tree pruning. Our tour will include a pasture walk, a meet-and-greet with our dairy cows, sheep, poultry and pigs, and a chance to sample some of our farm products. Farm raised meat, raw milk, honey, maple, and ferments will be available for purchase at the farm store. Please note: Dogs are not allowed on the property at Rebop Farm. Directions: From Brattleboro, take High Street, which becomes Western Avenue. After passing I-91 at Exit 2, it becomes VT Route 9 West. Continue 2.7 miles past I-91 on Rte 9 and turn right onto Sunset Lake Road (just past the Chelsea Royal Diner). The farm is 2.5 miles on the left. This year, the Robb Family Farm is hosting the famous Tour de Heifer. Please stop in at the farm to meet the Robbs, participate in an informal farm tour, shop their products, purchase a hearty farm lunch and enjoy the Tour de Heifer festivities. 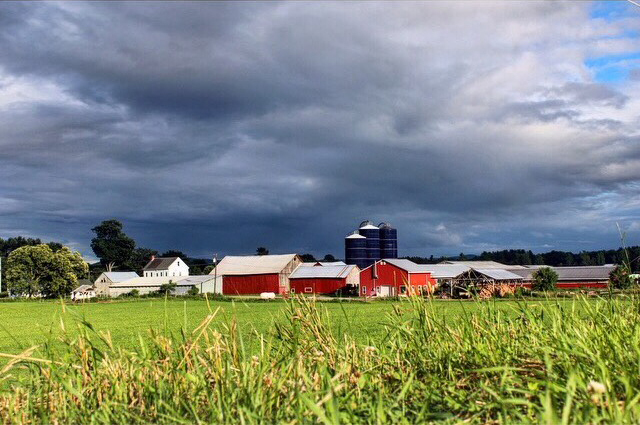 The Robb Farm has been farming on our land in West Brattleboro for more than 100 years. Currently, two generations of Robbs are the farm’s owners and stewards. 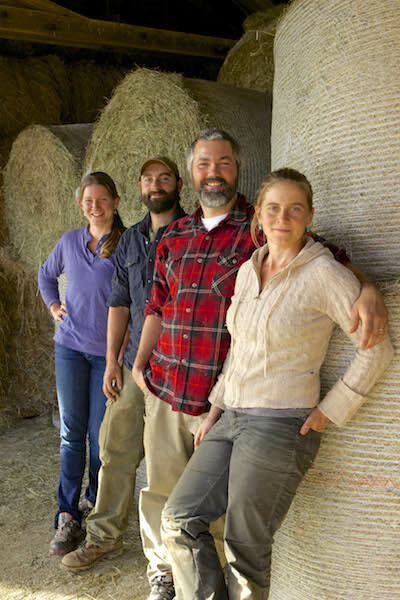 Formerly a dairy farm, the family is currently focusing on two areas: maple syrup and grass-fed beef. The cattle are pastured and are not fed any grain or corn. We have 4500 maple tree taps, and have turned our milk room into a candy kitchen where we make all of our maple cream, candy, sugar and added value maple products. The farm store will be open, and maple products and meat will be available for purchase. Guests are welcome to walk the surrounding acreage of the farm, bring a picnic and sit by the meandering brook or at the picnic tables. Directions: From Brattleboro, take High Street, which becomes Western Avenue. After passing I-91 at Exit 2, it becomes VT Route 9 West. Continue 1.3 miles past I-91 on Rte 9 and turn left onto Greenleaf Street (after passing West Brattleboro Pizza). Go approximately 1.5 miles, and continue straight onto Ames Hill Rd (dirt). Farm store is approximately 1.5 miles on the left (approximately 3 miles from Rte 9). The Miller Farm is an organic dairy farm in the Connecticut River Valley in Vernon, VT. We milk around 170 registered Holstein cows, with an additional 150 dry cows and heifers. Our milk goes to make Stonyfield yogurt. We have about 600 acres under management, providing grass, alfalfa and corn for feed. During the summer season, all but our youngest calves graze at various paddocks. 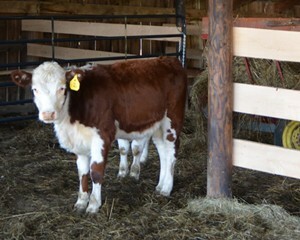 The farm tour will visit our milking parlor, small calf raising area, and answer any questions you may have! If you plan to visit 4 farms, we suggest one of the following itineraries, which entail a traveling time of no more than 30 minutes between farms. You may also opt to visit 2-3. Plan to drop in at the Robb Family Farm Open House at any time between 9:30-4:00. Please print out our map or use your GPS or smart phone to enter addresses for the most direct routes. Please provide your email address so we may send you, about a week in advance, tour information including map, directions and special activities. Since tour sizes are limited, please be accurate! Please limit your group to no more than 6 people. Please select one farm, or answer "none" if you don't wish to visit a farm in this time slot. Any donation you would like to make to the organization is much appreciated, and fully tax-deductible.